As David Laws put it last night, you wait years for some research on a critical question and then, like with buses, it all comes at once: In recent years the apparent success of London’s schools has been considered one of the biggest puzzles in English education but this week has seen big developments in our understanding of what has gone right over the last ten-to-fifteen years. On Monday, the Institute for Fiscal Studies and the Social Mobility and Child Poverty Commission published their report showing that a large part of the London advantage can be explained by the performance of the capital’s primary schools. 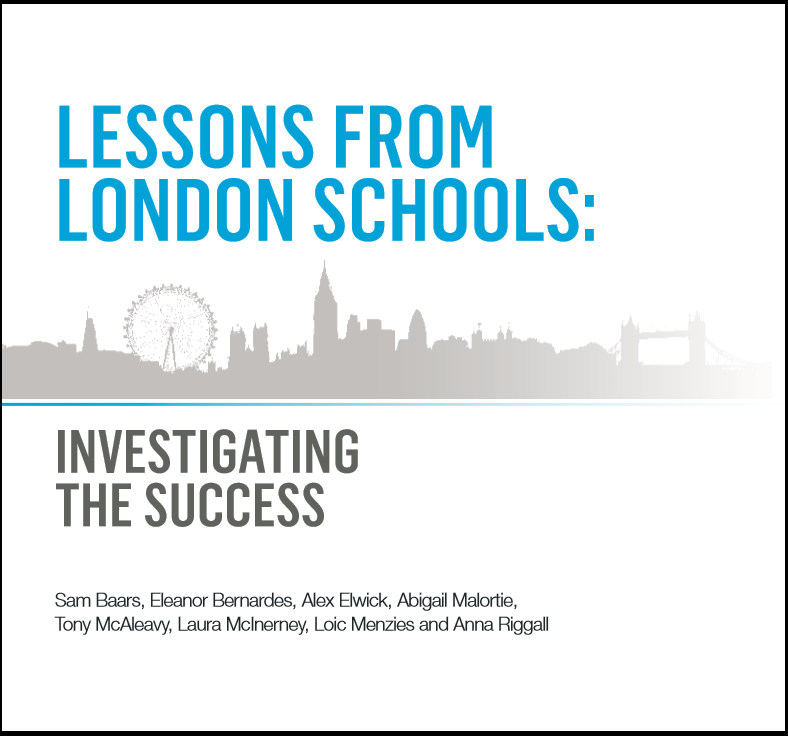 Today, Centre for London and CfBT Education Trust publish “Lessons from London Schools: Investigating the Success,” a report the LKMco team has helped draw together from scores of interviews, datasets and a comprehensive literature review. 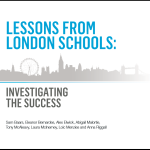 Pulling these two studies together gives us the best opportunity yet to understand the remarkable success of London’s schools but how do the two studies fit together? It was outside of IFS’ scope to look at the whole education system across the period of improvement, but given the sequence of events, the authors suggest the National Strategies may have played an important role. Despite primary schools being outside our scope, several of our interviewees made reference to primaries’ important role and the contribution made by the National Strategies. This was particularly notable in two of our six focus boroughs: Barking and Dagenham and Tower Hamlets. Yet this may not explain the full story. 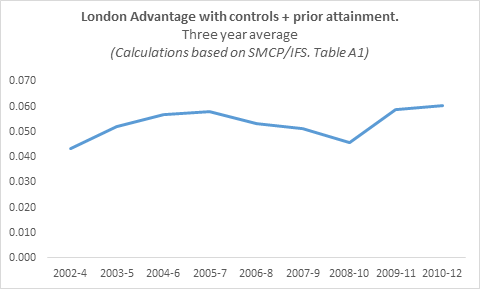 Although the IFS concluded that primary performance explained much of the London advantage, they found that even controlling for primary performance, a secondary school advantage remained. The significance and consistency of the London secondary advantage is best illustrated in this graph from Chris Cook. 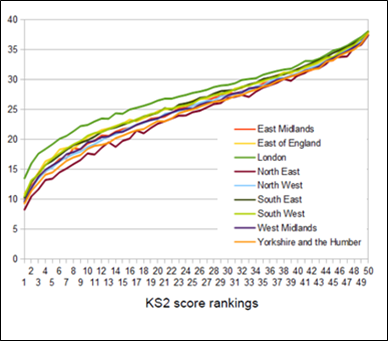 It shows pupils’ GCSE performance by KS2 attainment excluding equivalents. It shows that regardless of their prior attainment, pupils in London’s Secondaries do better compared to pupils with similar KS2 attainment elsewhere. London’s Secondaries therefore also have important strengths and some of these may be shared across both phases. The IFS argue that programmes like academies, Teach First and London Challenge cannot explain London’s success because they were not prevalent in primary schools during the period of improvement. To some extent this is true. Similarly, we found no one London story when it came to these programmes: different boroughs had contrasting experiences and trajectories. 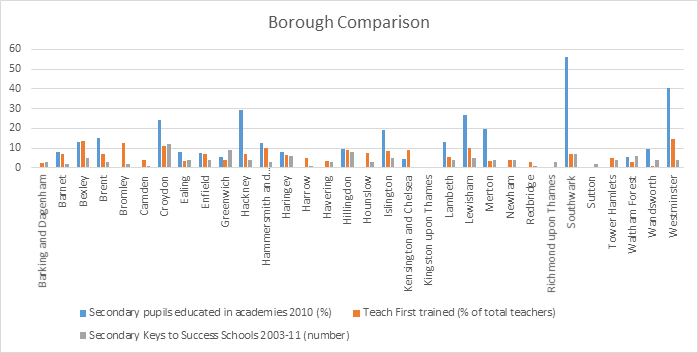 No single programme or policy can claim credit for the improvement: some boroughs had many Teach First-ers, some had few or none; some opted for rapid academisation or outsourced their local authority, others drove improvement through their borough leadership; some had large numbers of Keys to Success schools (the most intensive London Challenge intervention) some none. Yet almost, (though not all), succeeded. Shortages of teachers were dealt with and re-advertising rates for school leaders dropped dramatically, inflated school deficits shrunk and dilapidated buildings were replaced. Underperformance was robustly, fairly and objectively challenged using data that highlighted contextually similar schools and focused on progress as well as attainment. 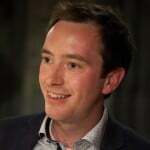 London was ahead of the curve on this because expertise from ILEA (the Inner London Education Authority) moved into local authorities like Tower Hamlets and because London Challenge’s leaders promoted the use of contextually informed data – for example through ‘Families of Schools’. Where schools failed to improve, Local Authorities and central government were willing to take radical steps like federating or academising schools and outsourcing failing boroughs. This sent out strong signals that schools had no choice but to improve and removed the worst performers from the system. A shared identity and a moral purpose was created and reinforced by using positive language about ‘London Schools’, ‘London Teachers’ and being ‘the best’. These were reinforced by programmes like Chartered London Teacher, Key Worker Housing and professional development opportunities, all of which were symbolically powerful. These changes were coupled with a new sense of possibility involving ambitious goals and school collaboration which illustrated what might be achieved. Whilst this sounds intangible, the contrast with the much maligned ‘national challenge’ could not be clearer. These approaches were underpinned by London’s unique demographic context, the opportunities available and the city’s unusual borough-based political governance. Our interviewees argued that it was these cross cutting principles that changed the culture of schools and that led to the outstanding teaching and leadership which ultimately transformed outcomes. The views in this blog are my own and whilst my analysis is predominantly based on the IFS and CfL/CfBT reports, not all the data I have presented here are in either report.